Of the many ways in which revolutionary ideals have backfired in the Islamic republic, perhaps none is more visible than the Iranian obsession with physical beauty. Far from focusing on internal spiritual values, young people – some aged 14 – are having cosmetic surgery in the hope of attaining "doll faces" to make them look like the actors they see in Hollywood films and satellite television programmes from the west. 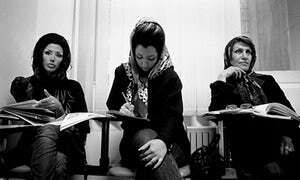 Iran has the highest rate of nose surgery in the world. According to a report in the conservative Etemad newspaper, as many as 200, 000 Iranians, mostly women, go to cosmetic surgeons each year to reduce the size of their nose and make the tip point upwards. For many, surgery is a reaction to the restrictive rules of compulsory hijab. "They won't let us display our beauty, " one woman said. "It's human nature to want to seek out attention with a beautiful figure, hair, skin … but hijab doesn't let you do that. So we have to satisfy that instinct by displaying our 'art' on our faces." Others see it simply as taking advantage of the benefits of modernity. "Science and technology have progressed, and people can look more beautiful, " said one. "Why shouldn't we?" The spike in inflation experienced by Iranians in recent months has compounded the already high price of such surgery. At present, the cost of an average nose surgery in Iran is 50-100m rials (about £1, 100-£2, 200), a tummy tuck can be had for 30-70m rials, a facelift runs to 30-60m rials, and a complete forehead lift can cost as much as 150m rials. This in a country where the average worker in a major urban area earns about £275 a month. Are customers satisfied with the results of what they are voluntarily submitting to at great expense? Marjan is a 33-year-old clothing store owner. She has had two cosmetic operations: one for her nose, and one for her eyelids and eyebrows. For her nose surgery in 2009, she paid 45m rials (then about £2, 800), and for her eyelid and eyebrow work in 2011, 25m rials (about £1, 300 at the time). "Probably because there were other distractions and things going on when I was a teenager, I wasn't really thinking about altering my face, " she said. "But about five years ago I started really feeling the need to do it. I felt like my face was starting to weather a bit, whereas I could still look younger and prettier if I wanted." Marjan, who has had two temporary marriages, or sigheh, since separating from her husband, currently lives alone. "I think what myself and many other young girls see as a motivating factor for improving their appearance is simply landing a better husband who is himself in a better situation, in addition to having a better social life with a greater degree of self-confidence. I always used to feel like something in my face was lacking, and I really hated the way I looked when I laughed and smiled, so I was really uncomfortable dealing with people. I feel much better now, " she said. The work Marjan has had done has not been without complications. "I haven't had any problems with my nose, but after the eyelid and eyebrow surgeries, I sometimes get major headaches, and I still feel like there are stitches up there, " she said. Hanieh, a 35-year-old office worker, had a nose job recently enough that her face still bears evidence of the surgery. "It may take several months for the nose to take its final shape, " she said. "I'm a bit worried, though." Her concerns stem from the post-surgery difficulties among other patients she's spoken to: respiratory problems, the nose being dented or malformed due to rolling around in sleep or a physical blow, sinus pain and congestion during the winter months, growth of extra tissue or bone, and loss of the sense of smell. Hanieh said she obtained a bank loan of 70m rials to pay for the surgery. How did she accomplish that? She said the bank loaned her money to buy a car. She sold the car and used the proceeds for her surgery. "My nose looks just how I want it to look now, so I hope nothing comes up, " she concluded. Another woman who had surgery not long ago said: "I do have a better social life and I don't have to be ashamed of my big, fat nose anymore. In our family, different types of cosmetic surgery are a totally normal thing, and most of the women and girls have had their noses done." As for complications, "I haven't had any particular problems, except that when I get a cold, I get a runny nose something fierce. I have to be careful then. People who have really big problems after their nose jobs have their doctor to blame, though. They got what they paid for, which was a physician who didn't know his or her stuff." In recent years, men have caught nose job fever as well. Mohammad, who works in a makeup and accessories store in a busy area of Tehran, had rhinoplasty about two years ago. Along with improving his appearance in general, he cited attracting more customers as his main motivation. "I deal with hundreds of uptown girls and women every single day, " he said. "They all come to me when they want to purchase cosmetic supplies, so I have to look nice and spiffy for them." The Rhinology Research Society of Iran conducted a study in co-operation with Johns Hopkins University in the US which showed that the rate of nose jobs per capita in Iran is seven times that in America.